Earn 0.5 Qantas Points per $1 spent on eligible purchases up to $500 per statement period. Complimentary Qantas Frequent Flyer membership saving you $89.50 if you aren’t already a member. Only a low minimum income of $15,000 required for eligibility. Instant response within 60 seconds of application. 0.25 Qantas Points per $1 spent on eligible purchases above $500 per statement period. No special balance transfer offer for this card. It’s all about the points, and only about the points, and that’s good news for dedicated Qantas Frequent Flyer points collectors who are sick of paying for bells and whistles they neither need nor want. The ANZ Frequent Flyer Credit Card lives up to its name, delivering Qantas points and little else, and in the process presenting one of the lowest annual fees for a rewards program card. The very reasonable $95 annual fee has two components – a basic fee of $40 plus a rewards program service fee of $55. Plus you can have up to three supplementary cardholders to help you earn those valuable points. All good news so far. Unfortunately, you’ll pay $65 ($10 + $55) for each and every additional card as well as the $95 for your own, so you need to be pretty sure your partner/child/parent is going to earn enough points to offset the steep cost. Even at an optimistic value of 1.5 cents per QFF point, each supplementary cardholder needs to spend $4,333 per year before they enter positive territory. Most cards – even rewards cards – don’t charge for additional cardholders, so ANZ is going out on a limb with this high charge. Even if you do need at least one supplementary card, the cost is more than covered in the first year by the 25,000 QFF bonus points you’ll receive, provided you spend at least $1,000 using the card during the first three months. You could use the 25,000 points for three one-way economy flights between Sydney and Melbourne. You’ll need to be a new ANZ cardholder to qualify for the bonus points, not just switching from another ANZ card. Qantas charge an $89.50 joining fee for new entrants to their frequent flyer program, but ANZ will pay this fee on behalf of a cardholder who is not already a member. It’s a recognised fact that Visa cards don’t earn rewards points at the same rate as AmEx cards, and this is a Visa card. The 0.5 points per dollar earning rate is also not as high as the scale offered by the ANZ Frequent Flyer Platinum and Black credit cards, but it’s realistic given the much lower annual fee for this card. Unfortunately, there’s a very low $500 monthly points cap, after which the rate falls to a disappointing 0.25 points per dollar. The fact that the minimum credit limit of $1,000 is double the amount of the cap makes it seem even more restrictive. The fact that ANZ has organised a number of bonus point partners takes some of the sting out of the low cap. When you use your card to make purchases from these businesses you get additional points per dollar. This is on top of the standard 0.5 points automatically earned. The bonus partners include Qantas, where you’ll earn an extra 1.0 points per dollar spent on Qantas flights, Qantas holidays and QFF and Qantas Club membership. There are other bonus partners, which change from time to time, and ANZ will inform you who these partners are and keep you up-to-date as they change. These bonus points are uncapped. You can still earn them when you have exceeded the monthly spend cap for regular purchases. It’s a frequent flyer points card, front and centre, so there are no special interest rates or other financial inducements. There are up to 44 interest-free days on purchases each month, not the more accommodating 55 days, and there’s no introductory interest-free purchase period or interest-free balance transfer option. If you don’t pay off your purchase balance in full each month you’ll lose your interest-free days and start paying interest on the daily balance at 19.99 percent p.a. That’s a fairly typical credit card rate, and so is the 21.49 percent p.a. on cash advances. ANZ Visa cardholders can take advantage of ANZ Visa payWave to make contactless purchases without a PIN for amounts under $100. ANZ’s goMoney app provides a way to manage your card account on your iPhone or Android. The card is also eligible for use with Apple Pay, Android Pay, Samsung Pay and ANZ Mobile Pay, to allow you to tap and pay securely with your smartphone or other mobile devices instead of using your card. ANZ Falcon monitoring offers constant protection against potentially fraudulent transactions, and worldwide emergency card replacement lets you travel with confidence. The card comes with Visa Entertainment membership, giving you access to special events, entertainment packages and pre-sale concert tickets. There are no complimentary travel, extended warranty or other types of insurance policy with this card. The Qantas American Express Discovery Credit Card offers QFF points without charging a steep annual fee. The NAB Qantas Rewards Card has features and costs similar to this ANZ card. Compare these and other Qantas cards on our Qantas page. There’s no doubt that this is an ideal card for keen Qantas points collectors with an eye for cost effectiveness and no interest in other ‘benefits’ they may not use. It’s a pared-back card with no nonsense about free insurance but tempting bonus points in the first year. However, after receiving the bonus points you’ll need to be prepared to see your points accumulate at only a moderate pace. I love that I get frequent flyer points for every dollar spent on my credit card. It’s like having an extra bonus that can be used in the future to offset my travel. It definitely gives ANZ the competitive edge. I would recommend this card to anyone looking for a reliable credit card service. This card has a very good 50K Qantas FF points opening bonus. The card’s yearly fee is quite low and it comes with a free travel insurance policy, which is a good deal for any traveller. You get a Visa and AmEx at the same time, so you have the extra convenience of having two cards instead of one. AmEx earns more points but Visa is more widely accepted. I switched to this card on recommendations from ANZ staff, and found them to be very helpful. They explained the benefits of the switch and it was completed with minimal fuss. To my understanding, this card better suits my situation than my previous card. I wish I had consulted ANZ staff earlier to receive better value. It’s a good card with great perks (travel insurance is great). I’ve been using this card for many years now and have always been happy/impressed with the ease of use and quality of service. Accumulating frequent flyer points is easy and very useful due to travel arrangements. ANZ has been reliable in their service and I’ve not had any issues when using the card/accessing the account. The fee is reasonable for the service you are getting. This card is really good. I have had no problems really, as it is backed by one of the big banks whom I trust. I love the fact that the FF points are automatically linked and transferred too. It also includes insurance when travelling overseas when you use the card to spend approximately $250 towards your travel. This is a good credit card with rewards. To make the most of the card you need to pay all the closing balance each month by the due date specified — great if you are disciplined. Using the American Express card earns you more points, however not as many outlets take American Express. This card is easy to use, with great functionality. Yearly fees are high, however. Your rewards points don’t get added until three months after the goods are purchased. High fees are charged when used overseas. It’s not worth keeping this for Qantas points any more, as ANZ is continually reducing the amount of Qantas Frequent Flyer points you can earn. Good rewards but high fees. 1 point for every $2 spent, yearly fees over $100, and a short interest-free period. There are better rewards cards out there. The statements are mailed really late so it’s easy to miss a payment, and their online banking is difficult to set up. I think for the yearly fee there are better deals available. I have had this card for over 10 years and it works for me. I have accumulated sufficient points for several Aussie adventures. It has never been refused on overseas trips or here in Australia. Replacement when lost was easy and quick. I am considering looking around to see if I can find a better deal which will give me at least 1 point for every dollar spent instead of the 1 point for each $2 spent, but I still want it to be a Qantas rather than Virgin-linked card. I pay the balance each month so the interest rate is of lesser importance, though certainly it is unreasonably high. ANZ Frequent Flyer allows you to live your life comfortably. Don’t dream of flying away from your bad credit and debts. Live grounded with ANZ, a big bank that allows you to dream big without compromising on essentials. Live a little, frequently. ANZ has conveniently located ATM machines, branches and internet availability. ANZ Qantas reward points, love it! Getting Qantas reward points is really good, and there’s no annual fee (for the first year)! It’s an excellent idea to have this credit card, to have rewards for life and enjoy everyday shopping, spending and earning. Good spending, good credit card and good rewards. I love to see the points accumulating. Good card, secure, but fees for rewards program are quite high. ANZ is a good bank to bank with, and I do value the security and trust I have with the bank. I like to keep all of my accounts in the one place and have them conveniently linked together. I feel that this credit card is really good and does what I need. It allows me to accumulate frequent flyer points, so I am closer to going on a holiday in the sun away from the cold this winter. The travel insurance that comes with it saves me heaps of money as well. The card is a no frills rewards card that offers a low interest rate and has a companion AmEx card. The only thing I would suggest that would be an improvement on the card is if the Visa card earned more rewards points. I find ANZ to be a trustworthy and reliable provider who have always been able to assist with any problems. Suited when our mortgage was with ANZ. Not now! We paid no, or very little, fees for years. Now that our mortgage is with another bank, they just took $500 worth of fees without warning or contacting us to see if we were happy, or could be on a different setup. I will be looking at changing the balance over to a different company with lower fees in the near future. The whole reason for getting this particular ANZ credit card was always to collect Qantas Frequent Flyer points from everyday usage e.g. everyday purchases, bills, etc. However, as with most cards the value of the rewards have deteriorated and the cost of maintaining the card has increased since getting it. This is a good card that ears Qantas points, but it could have more features. Other cards have a higher annual fee, but more features. Most times I can get the fee waived or a loyalty bonus of the same or higher value. Customer service is friendly and helpful—I have never had any problems. I think most credit cards are similar, but some have higher interest charges and I think ANZ cards are more expensive than others for annual fees. I try to pay my credit card monthly in full so the interest rates don’t worry me too much. This is a good basic airline rewards card. It can be used everywhere and very accepted. It has average fees and charges, and when used for everyday purchases it is a good way of progressing towards a flight reward on things you’d be buying anyway. It is best if you pay the monthly account in full every month, otherwise the interest charged more than negates the rewards you accumulate. I don’t like high fees, but I do like rewards. How else could I have built up over 200,000 Qantas Frequent Flyer points without doing anything else but use my frequent flyer credit card and a few flights? I don’t need anything else to get me flying further. There is a high annual fee, but the QFF points are invaluable and have afforded me a free flight from Adelaide to Hobart for two adults each year. ANZ are particularly proactive with regards to security—they send an SMS text when suspicious activity is detected on your card. This has occurred three times since I got the card eleven years ago, and ANZ have been outstanding in handling it each time. The fees on this card are expensive. For example, the late payment fee is still $20, which is crazy when most other banks are under $10. Interest rates are too high. They should be only 10%. They need to drop the fees to be more competitive and get more customers. This card, like any card, has its good and bad points, but as long as you pay it off before the interest kicks in it can be a great card. I use it to pay all my bills and pay it off monthly so I don’t get hit with any interest. I currently have enough points to fly to Europe a couple of times. Also, if you book flights with it, you get free travel insurance, which is great because I fly a lot. ANZ have good customer service and are open 24/7. When you do call, you don’t have to wait for long to be connected. Customer service are to the point and very accurate information is given. Firstly I’m telling you to forget about the way banks have educated us to use their bank accounts. It’s all a rort! They insist you must have an everyday (transaction) account in which you pay all your salary and income and then pay all your bills out of that same everyday account (which co-incidentally pays no interest and most likely charges fees on top). They insist you must have an access card in order to use EFTPOS or ATMs to pay for your shopping and make cash withdrawals from this same account and maybe write the odd cheque. 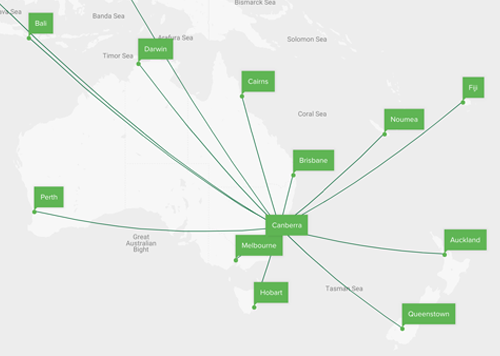 We are going on a 15 day holiday to Cairns with frequent flyer points – air fares, hotels and car hire – it didn’t take long to accumulate either! Great! Using AmEx builds points even faster. It is so much better than a debit card and so convenient. Online banking means I know my balances any time, any where, so I can keep track of how much I am spending. I’m not very pleased with the card. It has a high annual fee and an extra charge for any secondary cardholders. Furthermore, we are getting less than half the points for each dollar spent (more like a third). So, for me, it feels like quite a rip off. I am looking at changing to another frequent flyer card. Easy credit card to use. It has a high interest rate, but good credit limit and you earn frequent flyer points too. I also got an American Express card too. Can be used everywhere around the world. Easy to apply and to pay off the balance each month. I’m generally very happy with this card and would recommend it to everyone. i am really happy with our ANZ credit card. The rewards program is great and generous. i have used the frequent flyer points with Qantas already – nothing out of pocket at all. The online account management is easy to use and navigate. The interest rates seem high though, but they are normal for a credit card with rewards. I am very happy with the service given to me by my branch of ANZ and the credit cards they supply. I always feel confident that they sill be accepted where ever I may be, even in other countries. I find the fees charged are fair for the services received. Very user friendly card, I collate points easily. ANZ are very easy to work with. No lengthy phone queues, always very helpful. User friendly internet banking. Communication is key these days. They cover this on many levels of service, online, in person, when purchasing. What more could you ask for. I have been a customer for 17 years, having joined soon after I became a Qantas Frequent Flyer. In that time the ANZ have alerted me to its fraudulent use overseas, which I greatly appreciated. Any phone inquiries have been answered with courtesy and I have been pleased with any resolution. We trust the card company, and it has a very high recognition and status internationally which we have found valuable when travelling. We like the fact that it dovetails with our other banking products too. Any problems are quickly resolved by phone conversations with staff or even at the local branch! My ANZ Frequent Flyer credit Card is very easy to use and is accepted everywhere I go. It earns me valuable Frequent Flyer points every time I shop with my card. I have a very acceptable limit on my card which allows me to buy high priced items, or use it on holiday without fear of overdrawing my limit. Like any bank they do you no favours. Can not wait to penalise and gouge money from you at any opportunity. Ridiculously high fees charged whenever possible, interest rate remains way too high and never adjusted down with general interest rates. Hey, but what would you expect from a banking institution. We are particular thankful that ANZ gave us the opportunity to have an American Express card as well as the Visa card we have held for a number of years. It is great to be able to receive more frequent flyer points by using American Express with those merchants who accept this card. We were also SO thankful that ANZ kindly reimbursed our money when someone stole our credit card details some year ago while we were in PNG and used them to buy an item costing 100 British pounds from a store in Derbyshire in England. Our trust in our bank shot right up after that incident. I have had this card for around ten years and find it is very convenient and manageable. I am now a pensioner but continue to use it and accumulate points for travel. As I always pay on time the high rates of interest do not worry me. I have very little problems and when the card was stolen in Japan I had no trouble getting it replaced. Rewards are achievable unlike other cards where u have to spend a fortune to get a small item. U can either buy an item or fly somewhere. We go traveling every 3 years and have bought items like an iPad. It’s a great reward to get free gifts. I currently use both these cards attached to one account with the ANZ and both are liked to Qantas Frequent Flyers. I use the cards to purchase everything possible and benefit from the Frequent Flyer points on all purchases, not just travel. We have been able average one trip per year every year since this program was put in place, and these flights are transferrable. This card is accepted everywhere and I have great confidence every time I use it. I only use internet banking and find it really easy with this card. I earn frequent flyer points and generally accumulate enough points for a free flight every year just by using the card. They have great security, someone was “fishing” on my account and ANZ contacted me instantly and they cancelled my card and issued a new one on the spot. I have had this card for many years and as long as I pay the balance a few days before the due date, I don’t pay interest. I always make sure I pay well before the due date and don’t incur interest or late payment fees on my card ever. Not the cheapest credit card, but still is fine with me. I have used my point rewards with good results. It does take time and money to build up rewards, but heck, life is too short to fuss about. Great intro bonus and low apr on balance transfer. Then you are stung with over 20% if using the card. Keep it in credit and use it for points. Takes a while to come through though! Just like any other Visa/MasterCard really except with a monster apr once you actually use and owe money on the card. Bloody good card. I would be happy to recommend this card to anyone. I have always had pleasant dealings with the ANZ bank. They have always been willing to assist with any enquiries that I have and at all times I have been treated with respect and friendly service. I would recommend the ANZ bank unreservedly. I find ANZ to have the best service in all banking areas, including their credit cards. The staff are helpful and their cards offer great benefits with the Frequent Flyer package. I took the time to read the promotional booklet that came with my card and was amazed at all the other benefits that come with it. I like the frequent flyer points I can earn, but the interest rate is a bit high. It is convenient as it is accepted everywhere and makes internet shopping easy. I first got it for use when I travel overseas. I’m not sure about the pay wave system, could be easy to use if stolen. We appreciate the opportunity to amass frequent flyer points through our credit card spending. We have especially appreciated having the American Express card as well as the Visa. We would prefer to pay less for our annual card fee. We were glad they allowed us to hold this card account while living in Papua New Guinea as missionaries. Some other institutions would not allow us an account. Great that I can use one card and get my flyer miles at the same time so no need to carry extra cards for bonus points and no need to get an extra card out of my wallet when paying for things! All the frequent flyer points go straight to my Qantas frequent flyer points and I can spend them any way I choose. I have had this credit card for a few years now and have never had any problems with it. Whilst the fees have steadily increased (in contrast to 2 other credit cards which I have), I still think its excellent value. And the frequent flyer points really add up, and very quickly too. Highly recommended.